“Sylvio” was presented for therapy for sequela medical issues to a traumatic spinal cord injury. The primary concerns of the owner included weakness of his pelvic limbs and urinary tract infections. Sylvio’s owner wants to be certain he has good quality of life. Sylvio has responded well to integrative therapy for his pelvic limb weakness and urinary tract infections. Sylvio is a 6 year 4 month old neutered male domestic ferret. Sylvio’s chief complaint is continued paraparesis and urinary bladder infections. The paraparesis is the result of a traumatic spinal cord injury on December 24, 2013, in the care of previous owners. He sustained a step vertebral fracture of the third thoracic vertebrae (T3) with collapse of the intervertebral disk space between T3 and T4. The current owner adopted Sylvio at the time of injury. Initial therapy included pain control, corticosteroids, and Traditional Chinese Acupuncture. The acupuncture included four points, which the owner believes were urinary bladder points and two points along the vertebral column. Physical therapy was started six weeks post injury. The physical therapy included range of motion and strengthening exercises for Sylvio’s pelvic limbs. Sylvio continued to mostly drag his pelvic limbs with limited movement. Sylvio’s second issue is urinary bladder infections. Low level laser therapy (LLLT) was started in spring of 2015 with daily sessions and then tapered to twice a month. In October 2018, Sylvio was diagnosed with a severe urinary tract infection, which resulted from complications of his care during a time when his owner was out of town. Suspected to be the result of less consistent urinary bladder expressions. The urine was cultured and showed sensitivity to Clavamox. The course of antibiotics was completed. Owner believed the infection was cleared, although no post antibiotic urine culture was completed. Over the next couple of months intermittent episodes of malodorous urine were treated with Clavamox to clear the possible urinary tract infection. Kathryn (the owner) presented Sylvio to me at Midnightsun Animal Hospital on December 19, 2018 to see if medical acupuncture therapy and integrative therapy could help with the chronic traumatic spinal cord injury and urinary bladder infections. Sylvio currently is living with multiple ferrets in a large room which is ferret safe. They have enrichment safe toys and plenty of time with their loving dedicated owners. Sylvio’s physical exam findings include eyes and ears within normal, mucous membranes pink and moist, dental is normal, heart and lungs auscultate normal, abdomen is benign on palpation with moderate splenomegaly, and mild alopecia on his distal rear limbs. Neurologic examination found paraparesis with bilateral conscious proprioceptive deficits in his pelvic limbs. Voluntary motor and superficial pain are intact in his pelvic limbs. He has normal to slightly increased patellar reflexes and crossed extensor reflex is negative. The forelimbs are neurologically correct. Sylvio has decreased muscle mass in both pelvic limbs and along his vertebral column from the third thoracic vertebrae caudal through his pelvis. Myofascial palpation evaluation reveals restrictions are present from proximal cervical to his sacrum, with the greatest restrictions found in the cervical and cranial thoracic musculature and triceps muscles. Affected muscles included the trapezius, omotransversarius, cutaneous trunci, lattissmus dorsi, and the triceps. This is consistent with compensatory muscle strain patterns due to the paraparesis. He has kyphosis in the cranial to mid-thoracic region. Palpable microchip and Deslorelin implant in the caudal dorsal cervical region. Sylvio’s problem list includes paraparesis, urinary tract infections, compensatory muscle strains, myofascial restrictions, splenomegaly, and adrenal disease with mild pruritic alopecia. Urinary bladder infections differentials: sepsis, urinary tract bacterial infection, transitional cell carcinoma (TCC), urinary bladder diverticulum, urinary bladder expression, cystine cystoliths, interstitial cystitis, vertebral fracture resulting in upper motor neuron micturition, adrenal gland disease resulting in prostate hyperplasia. The definitive diagnosis for the paraparesis is the consequence of traumatic vertebral fracture with compression of his spinal cord at the level of the T3. The other differentials were ruled out due to radiographic evidence of the fractured vertebrae. The urinary bladder infections have a bacterial component and may also have some traumatic component with the mandatory urinary bladder expressions multiple times a day. Prostatomegaly, TCC and cystoliths were ruled out with ultrasound and urinalysis. Medical acupuncture and integrative neuromodulation (MAIN) technique, which involves input through the central, peripheral, and autonomic nervous systems was used to accomplish our treatment goals. Our primary goal of treatment is to increase the mobility and the strength of Sylvio’s pelvic limbs. Our secondary goal is to decrease the compensatory myofascial strain patterns in order to improve quality of life. Our tertiary goal is to eliminate the urinary bladder infections. Dry needling acupuncture therapy was completed using SooJi Chim Hand Needles (0.18mm x 8mm long needle with 13mm “spring” style metal handle). LLLT was provided using a Companion Therapy Class IV Laser with settings selected for a feline (no ferret settings) with a thin body score, medium coat, and light skin color. Acupuncture sessions and LLLT occurred once to three times a week over a seven week period. Sylvio was cooperative during therapy as he happily enjoyed his turkey baby food or ferret gruel. Sylvio was placed in ventral recumbency on a towel covered pad. With this positioning, points were selected along the lateral sides of his pelvic limbs and dorsum. Acupuncture therapy was started with Baihui for central neuromodulation at the level of mid-caudal lumbar spinal nerves and for therapy with pelvic limb dysfunction. ST 36 was selected for autonomic neuromodulation and pro-anti-inflammatory effects through the nucleus tracts solitarius and dorsal motor nucleus of the vagus nerve. ST 36 is also helpful for pelvic limb dysfunction. ST 34 was used for stimulation of the femoral nerve. BL 60 was selected for distal peripheral nerve stimulation of the fibular and tibial nerves. GB 29 was used to stimulate the cranial gluteal nerve to strengthen the areas around the hip region. GB 30 was selected for stimulation of the sciatic nerve. GB 31 was intermittently used for stimulation of the femoral and sciatic nerves for pelvic limb neurologic dysfunction. BL 12 and BL 15 were selected for central nervous system stimulation cranial and caudal to the spinal cord injury. Acupuncture needles were also used to release taut bands and trigger points in the cervical and forelimb musculature. BL 28 was selected for stimulation of sacral 2 spinal nerve for genitourinary problems. 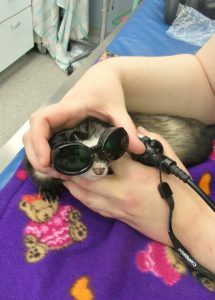 To obtain increased neuromodulation, on week four every other treatment or part way through a session the owner held Sylvio on his back as he enjoyed his ferret gruel to allow access to the medial portions of his pelvic limbs. KI 3 and SP 6 were selected for tibial nerve stimulation for urinary dysfunction. SP 10 was selected for femoral stimulation for the stifle and secondarily for pruritic skin conditions. BL 40 was used for tibial nerve stimulation for pelvic limb paresis and urinary retention. Sylvio did not allow needling of Bafeng points. LLLT for the urinary tract power was 6.5 watt on continuous wave for 120 seconds for a total of 780.0 joules and vertebral column, cervical, thoracolumbar, sacral, and pelvic limb muscles 3.0 watt power with continuous wave for 107 seconds for a total of 429.0 joules. Light massage was added to the owner’s normal physical therapy routine to help with Sylvio’s compensatory changes in his cervical muscles and forelimbs. The urinary tract infection appeared cleared in the middle of January with a negative culture; unfortunately symptoms returned after a week off of antibiotics. While urine culture and sensitivity were pending, Clavamox drops and Metacam were started. The antibiotic was changed to Enrofloxacin with the results of the urine culture and sensitivity. The owner and I have noted increased mobility of Sylvio’s pelvic limbs and tail since starting the dry needling acupuncture therapy. He recently started flexing his pelvic limb digits which had not been witnessed before. As Sylvio is moving around he is intermittently contracting his flexor muscles in the pelvic limbs to allow his hocks and stifles to be under his pelvis instead of dragging his pelvic limbs extended behind his body. He continues to be mostly non-weight bearing on his pelvic limbs. 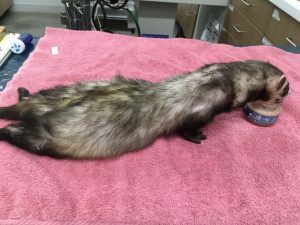 At week 6 of treatment Sylvio was seen standing on all four limbs in a ferret normal stance for a few seconds. The myofascial restrictions, number of taut bands, and trigger points have decreased in severity during the weeks of therapy. During the first couple weeks of acupuncture I could place the needles and Sylvio would allow them to stay in for 10 minutes or more. As time has gone by he is showing increased stimulation by the needles and shakes several out within a short period of time. The increased stimulation is occurring along both pelvic limbs. I am taking this as a good sign of improved neuromuscular response to MAIN therapy. Electroacupuncture would have been a good additional therapy, but this was not used as our clinic does not have electrostimulator. 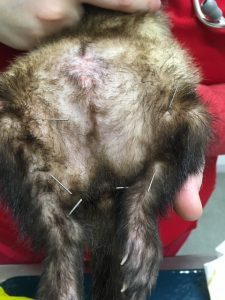 Additional points were not selected along Sylvio’s caudal thoracic to lumbar region due to very little muscle mass and subcutaneous tissue to place needles. Acupuncture therapy is going to continue weekly or twice a month, tapering as needed. LLLT has continued once a week for his urinary bladder and along his dorsum and pelvic limbs. We plan to complete a urine culture at four weeks of Enrofloxacin therapy. The ongoing antibiotic plan will depend on urine culture results with a post antibiotic culture taken one week after termination of the antibiotic therapy. This case has been especially interesting to witness neuromuscular improvements in a chronic case of traumatic spinal cord injury. Kathryn and Sylvio have been a pleasure to journey through the treatments with. I am looking forward to continuing our treatment sessions and pursuing further progress in his mobility and best quality of life. 1. Hamblin MR. Mechanisms and applications of the anti-inflammatory effects of photobiomodulation. AIMS Biophys 2017;4(3):337-361. 2. Robinson, N.G. DO, DVM, MS, FAAMA. (2016). Interactive Medical Acupuncture Anatomy. Jackson, WY: Teton New Media. 3. Robinson, N.G. DO, DVM, MS, FAAMA. (2015). Medical Acupuncture for Veterinarians: Canine Point Mini-Manual. OneHealth SIM Inc.